Compare Portable Ice Makers: NewAir Al-100, Edgestar IP210 or Avalon Bay AB-ICE26 ? There used to be a time when ice making machines were only used by establishments such as restaurants, hotels, and bars. But nowadays, more and more homes are equipping themselves with these small appliances and in particular with the portable types. When you have special receptions such as anniversary celebrations or barbecues on hot days, the quantity of ice produced by the freezer section of your refrigerator is never enough. Just the cocktails may use it all up! And even if you want to use more ice cube trays, on such occasions the freezer of your refrigerator is usually so full that it is impossible to find additional place for multiple trays. And for homes equipped with smaller refrigerators, the task is virtually impossible. If you have a large kitchen with a stand alone freezer, you may use it for freezing multiple ice cube trays, but even then, you may not have enough ice cubes for a large party or celebration. And let's face it, most people do not have a separate freezer, but have to do just with the freezer section of their refrigerator. If you have a portable ice machine at home, you can easily and quickly produce ice cubes before you start the reception, and you can store them in the freezer of your refrigerator (or in your separate freezer, if you have one). You will then have plenty of ice available when you need it throughout the reception. As portable ice machines are usually small, they are easy to carry and can be used either on your kitchen countertop or any other space in your home if you don't have enough kitchen counter space. They can also easily be carried along to the cottage to provide plenty of ice on hot summer days, or used in your RV or boat as long as you have adequate power source. Before proceeding further, it is worth reminding that these machines are not freezers, but ice cube makers. This article will compare the three most popular portable ice making machines bought by Amazon customers. 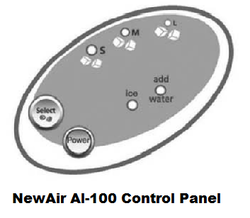 They are NewAir Al-100, Edgestar IP210, and Avalon Bay AB-ICE26. These three machines were the top sellers in their category at the time this article was written and had received excellent reviews from Amazon customers (an average of 4 star rating out of 5 stars for each of them!). Selected Ice Makers on Amazon. 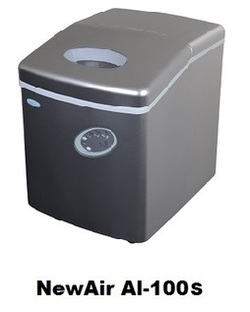 The NewAir AI-100 ice maker measures (15.00" H x 11.75" W x 14.50" L), is made of very sturdy plastic, and weighs 24.3 lbs. In spite of the compact design, it can produce up to 28 pounds of ice per day. Because it is portable, it does not require any permanent installations, and you can use it just about anywhere, your kitchen countertop, your home bar, backyard BBQs, around the pool, or in your RV. The machine produces ice in as little time as 15 minutes and gives you a choice of 3 ice cube sizes (small, medium or large). It is very easy to operate as it has a push-button electronic control panel with LED lights that indicate when to add water and when the ice is ready (see image on the left). 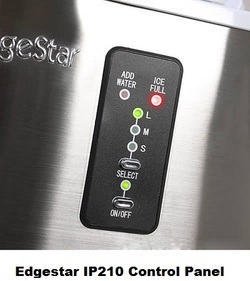 It also has a push button for selecting the ice size (the Select button) and additional LED lights that show the selected ice cube size (S, M or L). The ice bin is removable for easy dispensing. Cleanup of the machine is very simple thanks to its side mounted drain. All you need to do is just pull the plug to empty unused water. Finally, it also has built-in automatic overflow protection to prevent overfilling or blockage. The machine requires 115V to run (it can of course safely be used on 120 V outlets as there is always a tolerance of plus or minus 10%). It is offered in multiple colors (see Amazon products section below) and the silver color unit looks like it is made of stainless steel, even though it's made of sturdy plastic. An ice cubes scoop is provided with your purchase. This ice making machine comes with a 1-year manufacturer's limited warranty. 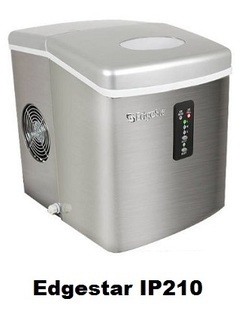 The EdgeStar IP210 ice maker measures (14 1/2" H x 11 3/4" W x 14 1/2" D) and weighs 40 lbs. For durability and style, it has a commercial grade stainless steel wrapped body and a matching lid. Like the NewAir, it can make up to 28 pounds of ice per day. It is portable and does not require any installations. It has a 1 gallon reservoir that can contain up to 2 pounds of ice at a time. The machine produces ice in as little time as 10 minutes and gives you a choice of 3 ice cube sizes (small, medium or large). It is very easy to operate as it has a push-button electronic control panel with LED lights that indicate if the machine is on, when to add water, and when the ice is full (see image on the left). It also has a push button for selecting the ice size (the Select button) and additional LED lights that show the selected ice cube size (S, M or L). To make ice, all you need to do is just plug the machine, pour in the water, turn it on, and select the ice cube size. No draining is required: once the ice is made, if not taken out, it will melt over time as the holding basket is not a freezer. The water produced from the melting ice will return back into the water reservoir so the unit may use it again to make more ice. Like the NeWAir, this machine is compact enough to be portable and can be used in a small kitchen, your RV, your boat or anywhere else where you can plug it. Note that it requires 115V to run (it can of course safely be used on 120 V outlets as there is always a tolerance of plus or minus 10%). The machine comes with a warranty of 1-year for parts and 90 days for labor. The Avalon Bay AB-ICE26 ice maker measures (14.70" H x 14.80" W x 11.00" D) and weighs 20 lbs. It has a simple, sleek design that complements any setting whether it's in your kitchen, sitting at the bar, or out by the pool. It is lightweight and portable, perfect for parties, camping vacations, and boat trips. If you like cold drinks, it's the best way to keep ice on hand. It can make fresh ice in as little as 6 minutes, and on its maximum settings, it can produce 9 ice cubes every 6 minutes and up to 26 pounds of ice per day. It comes with 2 ice sizes to choose from, small and large. It is equipped with easy-to-use push button controls, automatic overflow protection as well as an indicator light that lets you know when the ice basket is full and when you need to add more water. It also has a bottom drain that makes it very easy to empty and clean, and it features a see through lid at the top, so you can see exactly what's going on inside. This ice maker comes complete with an ice scoop and basket. Any unused ice will melt back into the reservoir and be recycled into fresh water. The Avalon Bay AB-ICE26 ice maker is very easy to use. The push button controls are clearly labeled. 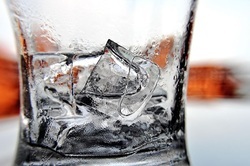 You just need to fill the water reservoir to the water line and select an ice setting, small or large, and the machine will begin making ice automatically. Finally, note that it uses environmentally-friendly R-134A refrigerant, operates on 115V using a standard electrical outlet, is offered in multiple colors and comes with a 1-year limited warranty. So, which of the three ice makers to get? The three portable ice makers considered here are excellent products as shown by the average rating each had received from Amazon customers at the time this article was written. Indeed, both NewAir and Avalon Bay had received 4 stars (out of 5 stars) while Edgestar had received 4.5 stars. Note also that the Avalon Bay ice maker was the number one seller in the portable ice maker category. Therefore, there is a good chance that you would be quite happy with any of these three products. All three products are small enough and portable to be used any place where they can be plugged. All three products are equipped with LED status lights and a push-button control panel. Newair and Edgestar ice makers can make 3 different sizes of ice cubes (small, medium and large) while the Avalon bay ice maker makes only 2 sizes. All three ice makers have LED lights that indicate when water is required and when the ice cubes are ready. They also display the size of ice cube selected. All three ice makers produce ice very fast, but according to specifications, Avalon Bay ice maker is the fastest, as it can produce ice cubes in 6 minutes (Edgestar takes up to 10 minutes and NewAir may take up to 15 minutes). Edgestar and Avalon Bay gives you a choice of colors while NewAir comes only in stainless steel finish. All three products provide a 1-year manufacturer's warranty. Please click the ice maker of your choice below for price information or to purchase. Note: Amazon often provides a good discount on the list price of sold products. The list price and the actual Amazon price will be shown when you click the images below.